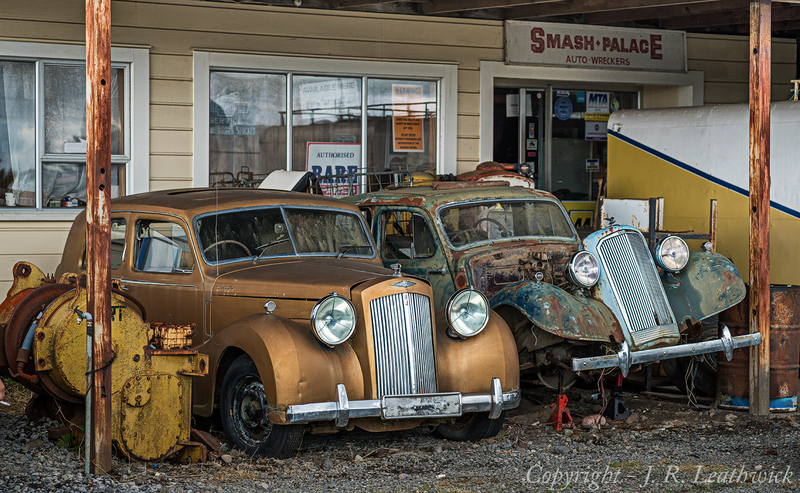 While its well outside my usual interest in New Zealand’s wild places and things, we recently spent a weekend in Ohakune with a photography friend, and he suggested that we pay a visit to Horopito Motors – more usually known as ‘Smash Palace’. This latter name comes from its association with the iconic 1980’s Kiwi film of the same name that featured Bruno Lawrence as a former race car driver who runs a car-wrecking yard in the central North Island. Well the car yard was not just a set constructed for the film – its a real life vintage car wrecking business located at Horopito (between Ohakune and National Park) with literally acres and acres of old cars of every make, description, and stage of decay. We spent an interesting couple of hours there, the main challenge being what not to photograph – the choice was endless. I took over a hundred images, but have selected out just a few of these below. I used a small set of primes on my Sony A7R II – a Canon tilt-shift 24 mm, which was perfect for some shots requiring large depth of field, a Loxia 35 mm, and my diminutive Elmarit-M 90mm – a perfect small telephoto to pair with the Sony. For any other punters keen to visit this yard, admission will cost you the princely sum of just five dollars – and it will certainly sharpen your appreciation of the impermanence of human creations.